Dyeing and The Unexpected Legacy. I've been doing some dyeing and that means that for one afternoon all the patio furniture on the deck was draped in drying fabric and trim. Lovely day for it too. For some reason all this was of great interest to the gold finches. When I went out to check on things, several males were sitting amongst the black and purple items. Not that I was expecting purple... but such is the nature of dyeing. So it was once I had these bits dyed and hanging out to dry that I discovered The Unexpected Legacy. When I was a kid my grandparents lived next door, and my grandmother loved to dye things to perk them up. 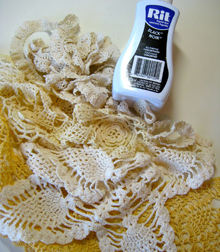 On a breezy summer afternoon, curtains and chenille bedspreads would be transformed and refreshed with a couple of packages of RIT dye. This was great. It was only after the intended articles had been soaked, rinsed and hung on the laundry line that the trouble started. The problem was that my grandmother hated to waste a big pot of dye. So she'd start looking around for other things that she could make pink or orange or ... well, it was the '60's so you can just imagine the colours. Clothes. Toys. Canvas running shoes. You name it. We had to have eyes in the back of our heads on dyeing day. Skip forward to a warm September afternoon in 2012, where I find myself eyeing this nice bath of black (yes, RIT) dye and wondering what else I could put in there. Surely it was too good to waste? Yikes! It seems that I have inherited my grandmother's dyeing penchant. That's one very Unexpected Legacy.